Dramatic rocky coastlines, verdant pine forests, pretty olive groves and rolling vineyards – the Peloponnese is as rich in natural beauty as it is in history. The wealth of archaeological sites in the area include the Sanctuary of Asklepios at Epidaurus, with its renowned amphitheatre, and the legendary citadel of Mycenae – both are UNESCO World Heritage Sites. 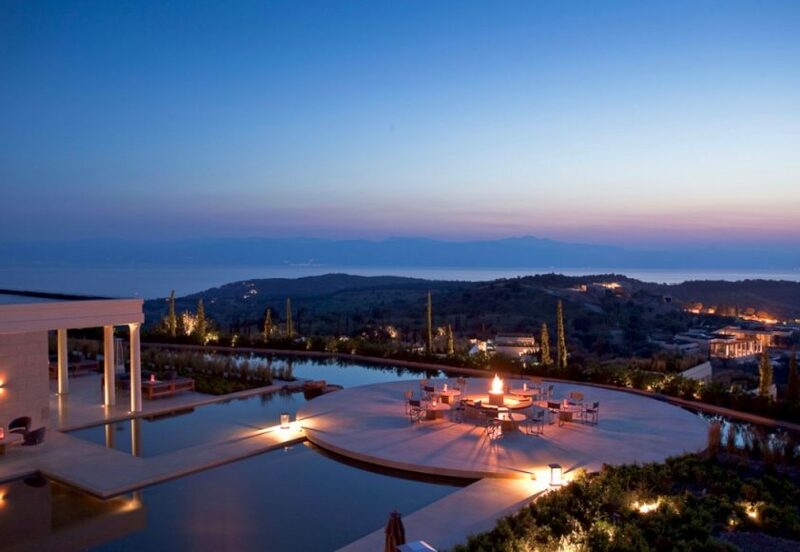 On arrival at Amanzoe the somewhat lengthy drive from Athens is instantly forgotten. 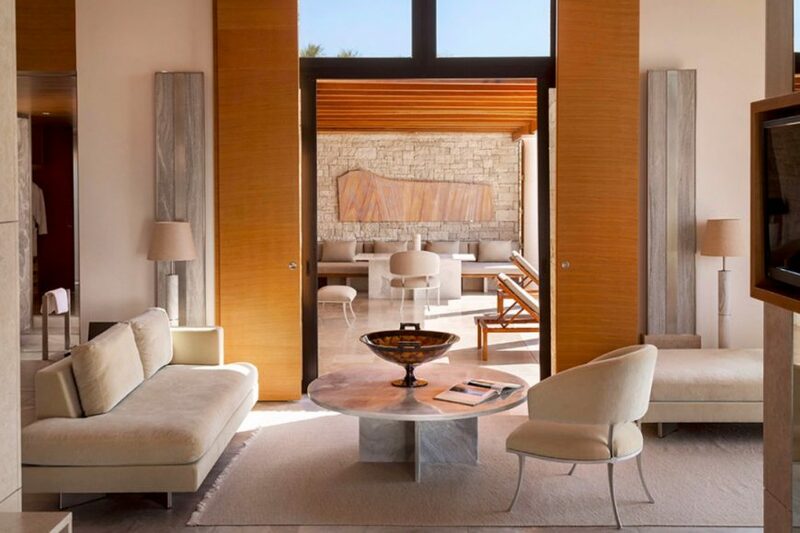 Set on an idyllic hilltop location in Greece’s eastern Peloponnesian peninsula, with breathtaking views across the forests, mountains and sea, Amanzoe is a jewel in the prestigious Aman collection – and cited as one of Europe’s most elite retreats. Uber-luxe private pool abodes and laid back eateries dot walkways fringed with herb gardens and cypress trees. 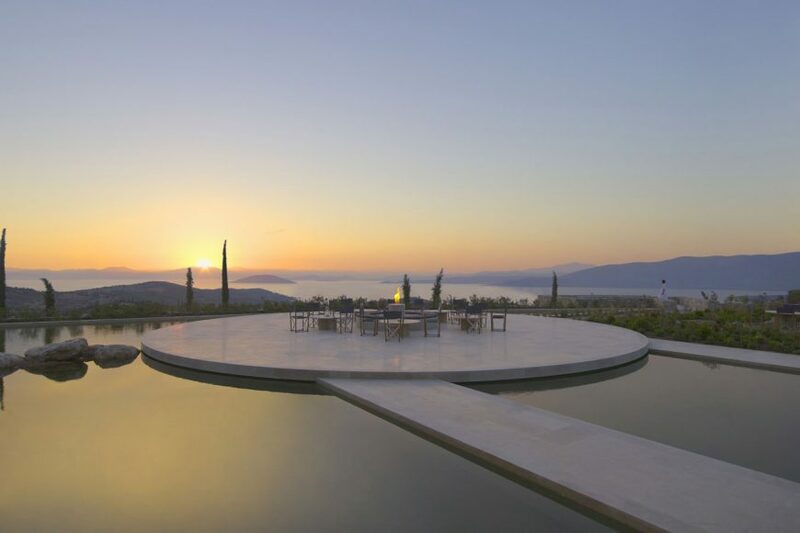 Drawing its name from the Sanskrit-derived word for ‘peace’, and ‘zoe’, the Greek word for ‘life’, Amanzoe offers a haven of luxury and takes Greek wellness retreats to another level. 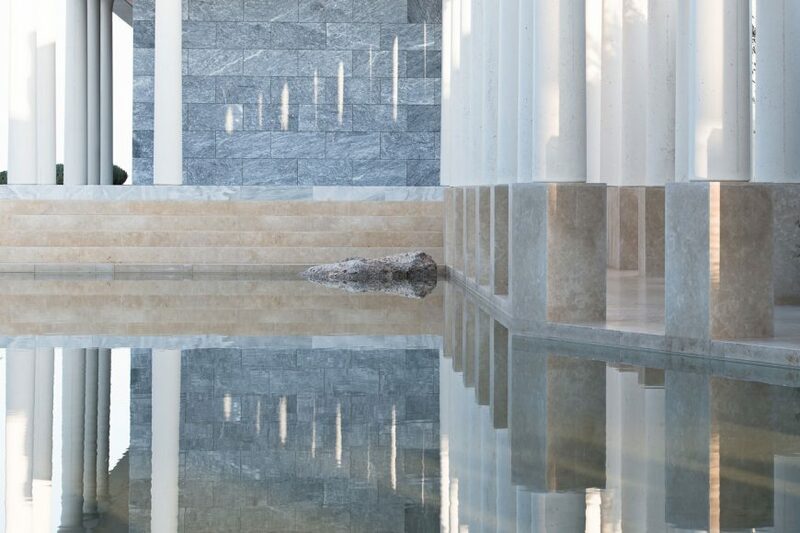 Aman spas are renowned as some of the best in the world and the Amanzoe spa doesn’t disappoint. The holistic healings of Hippocrates are the inspiration for the light-filled 2,850-square-metre spa. Facilities include 9 indoor and outdoor treatment pavilions with sunken bathtubs, steam rooms and relaxation areas, there’s also a Watsu pool, a Thai massage room and a manicure and pedicure salon. Therapies include The Zoe Treatment – an uplifting eucalyptus-infused steam bath, followed by a body scrub using local olive oil and sea salt. An olive oil body massage and laurel oil scalp massage completes the blissful ritual. Massages, scrubs and facials are available in five indoor and two outdoor spa spaces. Aman have recently launched their new skincare range of natural ingredients, many of which have been wild-harvested in various Aman destinations. 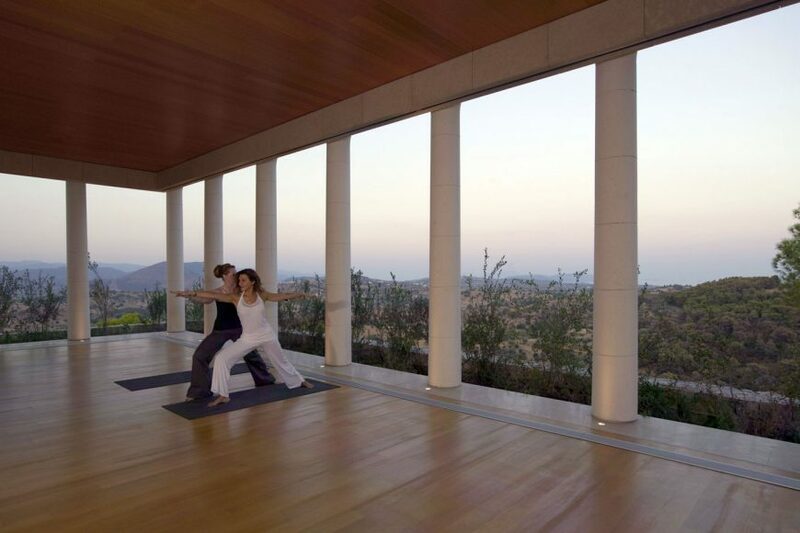 The yoga pavilion hosts a range of sessions for all levels from its tranquil hillside setting. Body alignment and breath awareness are the focus of the hatha, vinyasa or ashtanga practices, while full-moon yoga sessions are set in the Amphitheatre. At the Watsu pool therapy sessions involve floating in warm water, supported by a therapist’s arms. Sessions are known to support muscle rehabilitation and relieve stress. Simple Greek and Mediterranean dishes emphasise locally sourced ingredients at Amanzoe. Meals are served in the breezy sea view restaurant, as well as at the pool terrace. Try one of the amazing detox breakfasts and the grouper with ‘Horta’ greens, fennel tops and lemon sauce for lunch. By night you can dine poolside on Nama’s washoku cuisine – a culinary art that takes years to perfect, with local, seasonal produce at its heart. Take a trip to the nearby island of Hydra to explore it’s pretty harbour and markets. No cars are allowed on the island so you’re transported around by donkey. Explore Porto Heli and the wealth of nearby archaeological sites including The Sanctuary Of Asklepios at Epidaurus. Head down to the super-chic Amanzoe beach club, for a seaside lunch or sundowner – you can explore the coastline in one of the canoes and spend the night in one of the beautiful beach cabanas.